Our local bottle shop frequently hosts small wine tastings at their store. A good way to find out about tastings is by monitoring their Facebook page. We had learned by their posting that Dusted Valley wines would be there and would be pouring some of their wines. Well that was the only invite we needed. Chris did not have to worry about making dinner that night. 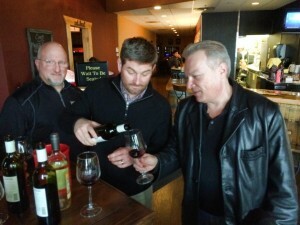 Pictured: Owner Phil, Chad pouring the wine. The tasting was at 5:30pm and we were the first ones there. Pouring the Dusted Valley wines was owner/grower/winemaker Chad Johnson. Since we were early I had the opportunity to visit with Chad. Since I am studying to be a winemaker I asked Chad many questions. 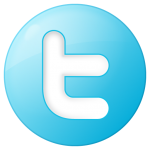 I also mentioned I write a blog and asked Chad if he would participate in my “Meet the Winemaker”. More on that on a later day. Chad poured two different labels. The Boomtown and Dusted Valley. We enjoyed both labels and Chris decided to purchase a bottle of the Dusted Valley Cabernet Sauvignon for dinner. Deep color depth and a purple hue. Dry, full-bodied with balanced acidity. Medium but soft tannins. Rich mid-palate flavors with a long lingering finish. Wine composition: 88% Cabernet Sauvignon, 7% Petite Verdot, 4% Cabernet Franc, 1% Malbec. 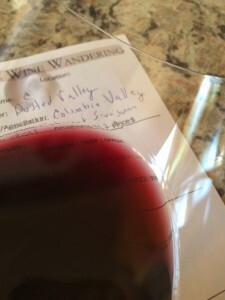 Dusted Valley will be on my next Walla Walla Valley trip. The wines are good at great prices. It is a good everyday go to red wine. 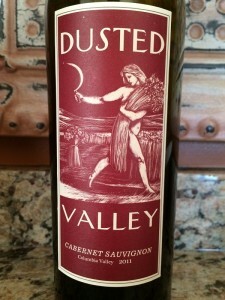 I rated the 2011 Dusted Valley Cabernet Sauvignon three glasses.